Paro is a gateway to Bhutanese economy, and that explains why our economy is unhealthy. I am quite new to this place to understand the secret to how they managed to keep the town so dirty. It's amazing how people can adapt to living in dustbins and I don't quite know how responsible authorities manage to sleep peacefully. 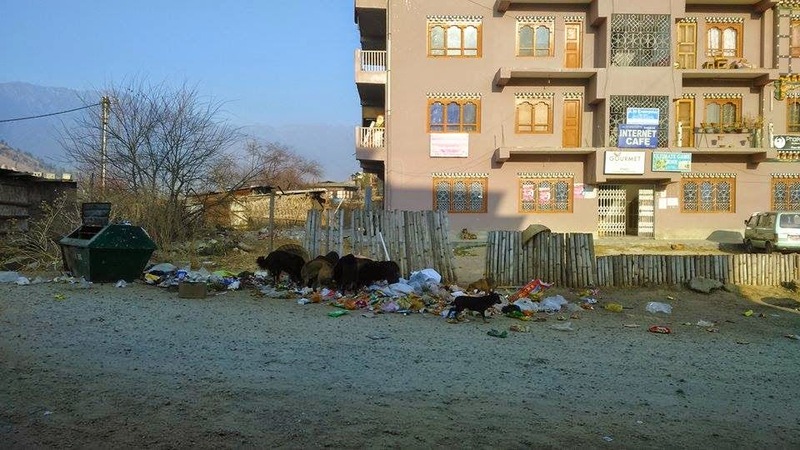 Someone told me a story about attitude of business people in Paro town; Once an elderly woman was seen dumping her waste in the drain in the middle of town, and as matter of fact he went to ask her to take care of her waste. You know what she replied? "O Boy, don't worry, scouts will come to clean up the town on Saturday." It's clear that all the good intentioned cleaning campaigns school children conducted in the town went on to pamper these people and it only taught them how to take waste for granted. I confirmed the story firsthand within my short stay in this place. One day Clean Bhutan brought along a passionate group of college students and cleaned the entire town. For the first time I saw the town clean. As always it took a cleaning campaign to let the town breadthe fresh air. I don't know how no Parob felt guilty about letting people from as far as Shrubtse and Gedu colleges clean their town. Quite obviously, unthankfully, and unfortunately I saw the town back to its sorry state just a few days later. 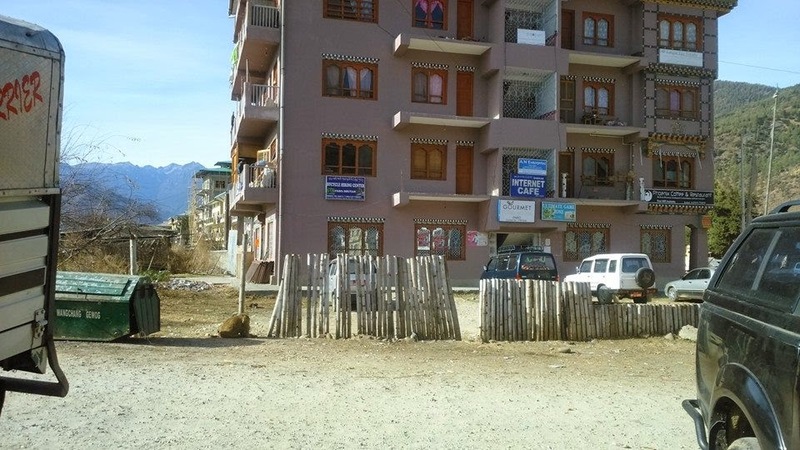 Following are the pictures of one spot I took to show you the state of Paro over the past weeks. Now they are waiting for another cleaning campaign! People living in this place should know that their irresponsible way of living could damage the image of the whole country. While they deserve to suffocate on their own garbage, they should not forget that they live on the gateway to Bhutan. Tourism keeps the heart of Paro beating and it's their natural responsibility to make the place worthy of the privileges it gets. 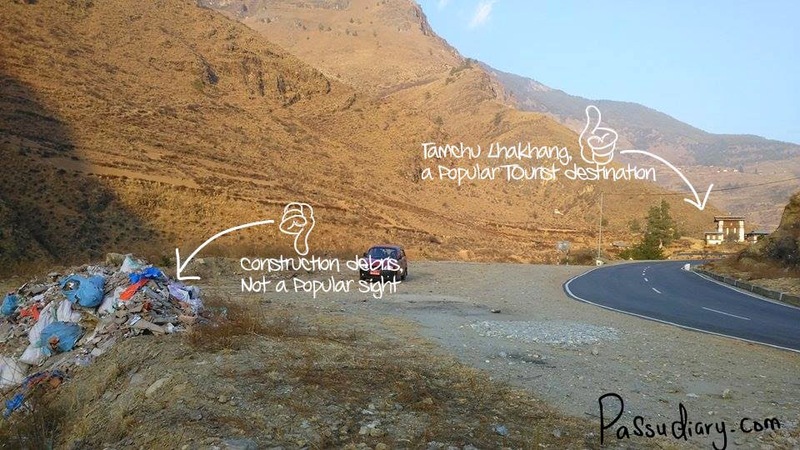 Be it the town or the way to Taktsang, it's time Paro stopped waiting for the goodwill of responsible people from elsewhere. For now there seems to be no municipal body in Paro, and if there is one perhaps it's time they surprise us by justifying their role. The location and size of mobile dustbins should be intelligently changed. The frequency of garbage collection around the town should be upscaled. Irresponsible people should be heavily fined, because education seemed to have failed but again they might say the garbage trucks don't turn up or the dustbin in the town corners are tiny. So basically it must begin with the change in system. I still remember following a garbage collection tractor along airport road that spilled waste all over the place as it sped ahead of my car. The plastics were flying on to my windscreen and sacks of waste were dropped on the road. Can you believe these were the people entrusted to manage waste? I also think the handicraft shop owners should lend their clean hands to make the town clean for their potential costumers to happily visit them. The same should be the moral responsibility of Guide Association of Bhutan and Association of Bhutanese Tour Operators (ABTO) to make the town welcoming for their bread to fly in. It is more than ever important to let Paro shine and glitter because 2015 is going to be big for tourism industry as Bhutan observes Visit Bhutan year. If Thimphu is the heart of Bhutan, Paro is truly the face and we can't present a dirty face to our guest. We haven't done it thus far and let us not set an unglamorous precedent by doing it when we are inviting the world to come visit our pristine country. Bottomline: Stop giving Paro fish, teach Paro how to fish! I remember a cleaner Paro before I left; but it was not surprising since international tourist numbers have more than doubled since then. More tourists = more trash. 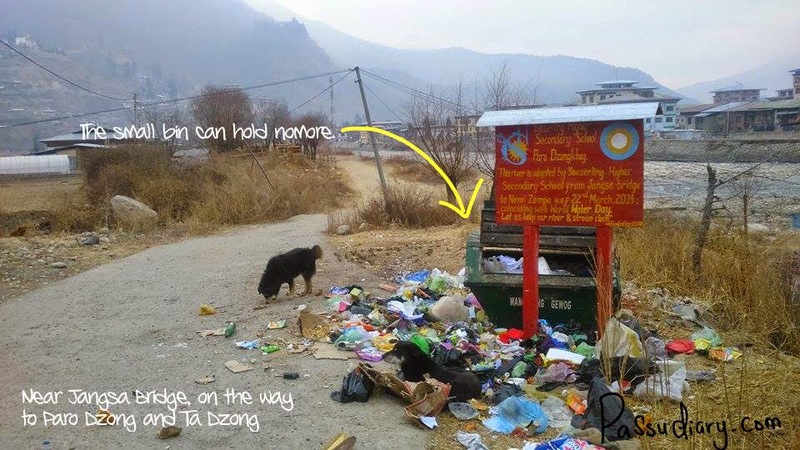 Singapore spends over US$100 per person on trash management per year; Bhutan was, as of 2010, spending less than US$2 per person per year. 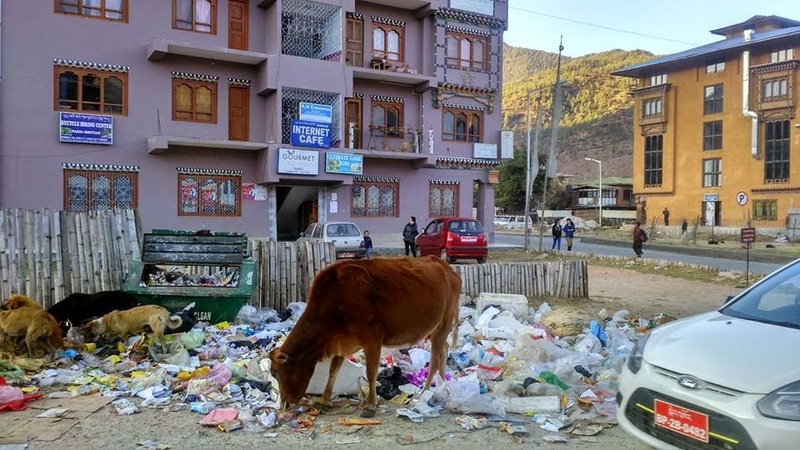 My guess is that, the amount of money going towards clean up the place is not keeping pace with the number of tourists Bhutan is receiving as well as the increase in population.